What would you do if you went to draw water from your village well and found a tiger trapped inside? Or if you entered the kitchen in the hotel where you worked and came face to face with a leopard? These two scenarios are real-life events that have happened to people living in the Satpuda Landscape of central India where Born Free’s Living with Tigers programme operates. Thankfully, both events ended without incident to either human or animal, but they show that the local communities who live alongside wildlife have to adapt even the most basic of everyday tasks to avoid conflict. Though instances like the above do happen, they are rare. About 85% of all conflict actually occurs when people venture into the forest – entering the territory of wildlife. This is why Living with Tigers is working with communities across Satpuda so that communities and wildlife can live together peacefully. For example, Living with Tigers operates a bamboo initiative (pictured). 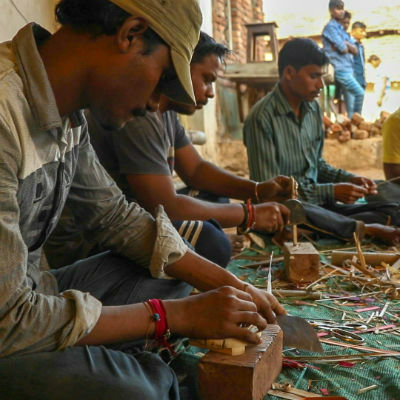 Established in 2015, this is a workshop for local people to make and sell household and decorative items from bamboo. Before the scheme was set up, people were illegally taking bamboo from the forest – putting themselves at risk of conflict with wildlife and if over-exploiting the bamboo, degrading the natural environment. Through the initiative, bamboo is sourced legally and sustainably. It currently employs 10 people. 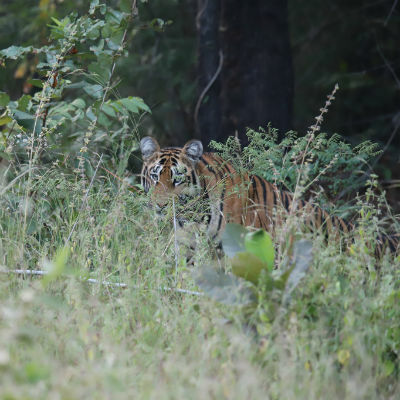 Living with Tigers also supports a bio-gas initiative. Through this scheme, bio-plants powered by cow dung are constructed in homes to provide a free fuel source for heating water and cooking. The dung is converted into methane, which fuels two table-top burners. This means that villagers do not have to enter the forest to collect firewood. Living with Tigers maintains more than 1,000 bio-plants across Satpuda, in effect reducing forest degradation caused by fuel wood collection and reducing the risk of human-wildlife conflict. Similarly, Living with Tigers supports a government-run scheme to build toilets across Satpuda. The toilets improve basic health standards, but also stop villagers entering the forest to relieve themselves, which can be a major cause of predator attacks on humans. Toilets have been introduced in almost 200 villages so far. The key to co-existence is tolerance, education and community engagement. Living with Tigers educates local communities to identify tiger presence in their area. For example, voluntary Tiger Ambassador teams are recruited in villages across Satpuda. These teams of five to seven men are trained to conduct regular patrols around their village, and to deal with wildlife conflict if it occurs. Communities are also taught the importance of tiger conservation and the benefits living alongside tigers can bring them, such as tourism or recognition. The good news is that Living with Tigers is making progress. In the last 10 years, tiger numbers have increased to a population of 500 across the Satpuda landscape and whereas 10 years ago, Living with Tigers concentrated on post-conflict mitigation, its work is now pre-emptive, reducing incidents of conflict and safeguarding humans and wildlife, alike. Living in the shadow of natural predators such as tigers, leopards or sloth bears is never easy, but Living with Tigers proves it is possible if local communities are included and solutions are compassionate.